Conceived and first modelled in June 1946. The present work is number 1 in an edition of 4.
with Hanover Gallery, London, where purchased by the present owner's husband in January 1967. Bull is Paolozzi's earliest known sculpture. The subject derived from Paolozzi's reading of Lorca and Hemingway. In 1946-47 he made numerous drawings of bulls and bulls' heads. Their reductive geometry, like the expressive distortions of Bull, illustrate Paolozzi's early passion for Picasso. In December 1945 he had been deeply impressed by the Picasso and Matisse exhibition at the Victoria and Albert Museum, which included 24 works by Picasso dating from 1939-45. In 1946 Paolozzi also knew Picasso's celebrated lithograph Bull, which consisted of eleven progressive states of the same image made between December 1945 and January 1946. Paolozzi's Bull was not included in his first one-man exhibition at the Mayor Gallery early in 1947, perhaps because he did not want to show it in plaster, where it might have been overshadowed by what he considered to be his more radical sculpture, Horse's Head, exhibited in three versions in coloured concrete. Bull dates from June 1946, according to a typed memorandum of agreement drawn up by a lawyer and dated 16 April 1960, in which Paolozzi gifted Bull to his wife Freda. 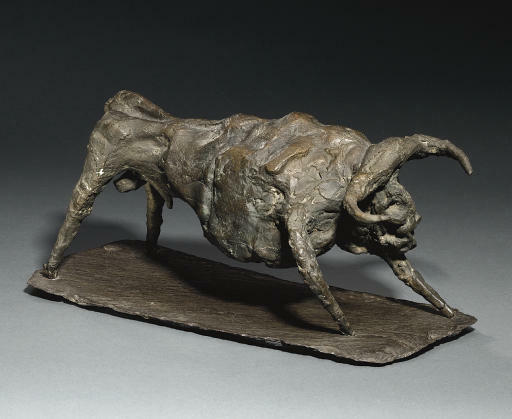 Bull probably did not exist in bronze before 1960, when Freda Paolozzi lent her cast to the Venice Biennale. Paolozzi probably re-acquired his wife's 1960 cast, and it may be the bronze Bull inscribed 'E. Paolozzi' on the inside of the back left leg, which was sold in these rooms on 6 June 2003, lot 204. All other known bronze casts of Bull, like the present work, are uninscribed, unmarked and unstamped. It is possible, therefore, that casts made by Paolozzi after 1960 are surmoulages, as no model of Bull, in clay or plaster, has ever been recorded. However, no dimunition in quality or detail, is detectable in any of the casts seen by the compiler. In about 1974 the late architect Cecil Elsom commissioned a cast of Bull with a gold patina; and Paolozzi had an additional two (or possibly three) similar casts made with a dark patina, probably by the Morris Singer Foundry. One of these darker casts Paolozzi gave to his wife to replace the one he had appropriated from her in the 1960s. Another was bought by Gabrielle Keiller who bequeathed hers to the Scottish National Gallery of Modern Art, Edinburgh, in 1995. We are very grateful to Robin Spencer for providing the catalogue entry for this lot.